OrCAD® was founded in 1985 by John Durbetaki, Ken Seymour, and Keith Seymour as “OrCAD Systems Corporation” in Hillsboro, Oregon. A supplier of desktop electronic design automation (EDA) software, the name OrCAD was a reflection of the company’s focus and the software’s origins: Oregon + CAD. The company's first product was SDT (Schematic Design Tools), which first shipped late in 1985. In 1986, the flagship SDT product was soon followed with a digital simulator, VST (Verification and Simulation Tools) and printed circuit board (PCB) layout tools. Over time, OrCAD's product line broadened to include Windows-based software products to assist electronics designers with developing field-programmable gate arrays (FPGAs), including complex programmable logic devices (CPLDs). Durbetaki, then CEO and head of R&D, left the company in 1991, and was succeeded as CEO by Michael Bosworth. In June 1995, OrCAD acquired Massteck Ltd., a small company that offered a PCB layout tool and a sophisticated autorouter, and Intelligent Systems Japan, KK, OrCAD's distributor in Japan. OrCAD made their initial public offering. OrCAD merged with MicroSim to acquire PSpice, a PC-based analog and mixed-signal simulation software for designing PCB systems. In July of 1999, OrCAD and its product line were acquired by Cadence Design Systems. OrCAD integrated with Cadence Allegro PCB design software creating a fully scalable solution for solving any level of PCB design challenge. In 2014, OrCAD rolled out its new brand identity, including a new logo and global website. 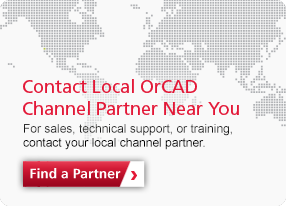 The brand identity highlights Cadence’s ongoing commitment to our PCB solutions and to our OrCAD customers.